Today's post comes from the Wild Elephant Project. At the end of each week, we do a "practice review" where we recap the week's practice. This week, I went a bit broader and shared what 5 weeks of practicing mindfulness has taught me. I thought it relevant to share with you here. And my mindful eating? Let’s just say it hasn’t been so mindful. Breakfast was gulped down as I figured out how to remove one fish from the filter. I’ve grabbed for my iced chai more times than I can count as I navigate phone calls between the vet and my daughter’s backpack and lunchbox. Outside, the snow falls and a dog barks. My breath is a bit shallow. This week has gone far different than I expected. (Most interesting weeks do.) The practice of mindful eating is one that I realized has the potential to make a profound difference in my life. I plan to continue it long after this week is over. 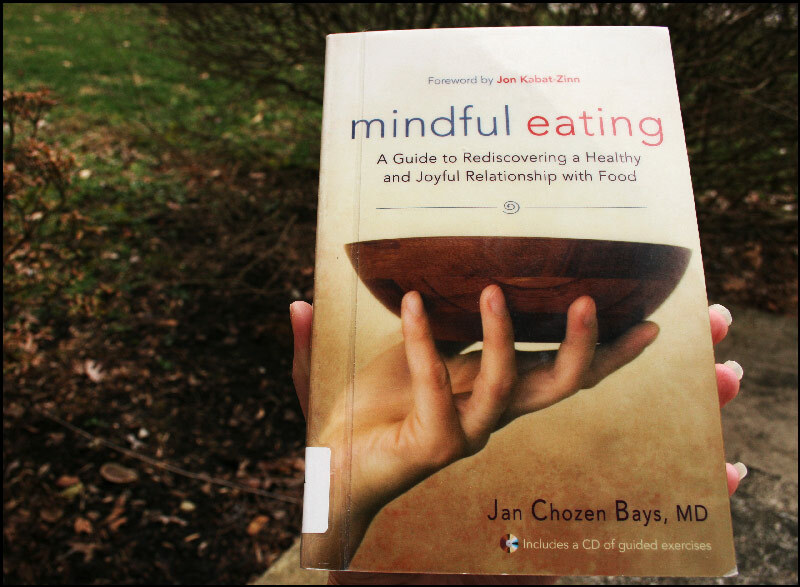 I recently picked up the book I mentioned by Jan Chozen Bays – Mindful Eating. I look forward to reading what further she has to say on the practice. (The book also comes with a CD ... for karma reasons, I plan to listen to it on the computer only after I buy it (this one is from the library...I don't want to download the tracks without buying it.)) If you happen to get this book as well, please let me know what you think! 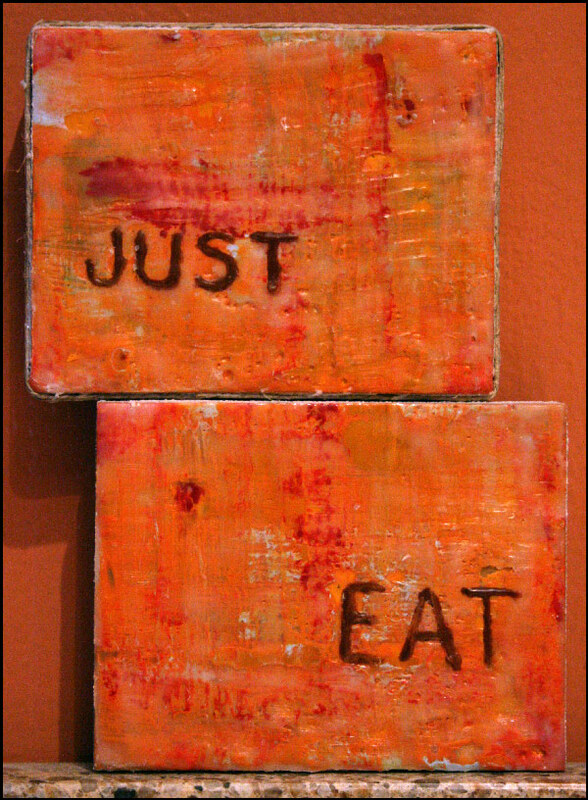 Also, while we will leave our son’s sign up, I have also made my own art to remind us to JUST EAT. I feel fortunate that we can continue the practice as a family. For this week’s review, I want to broaden my parameters. I want to share with you specific examples of the effects of practicing mindfulness. Some of us have been practicing for nearly 5 weeks now, trying different techniques to inform our awareness. Certain practices might have provided more insight than others. But I have found something fascinating today: That the results of each practice have become greater than the weekly insights. 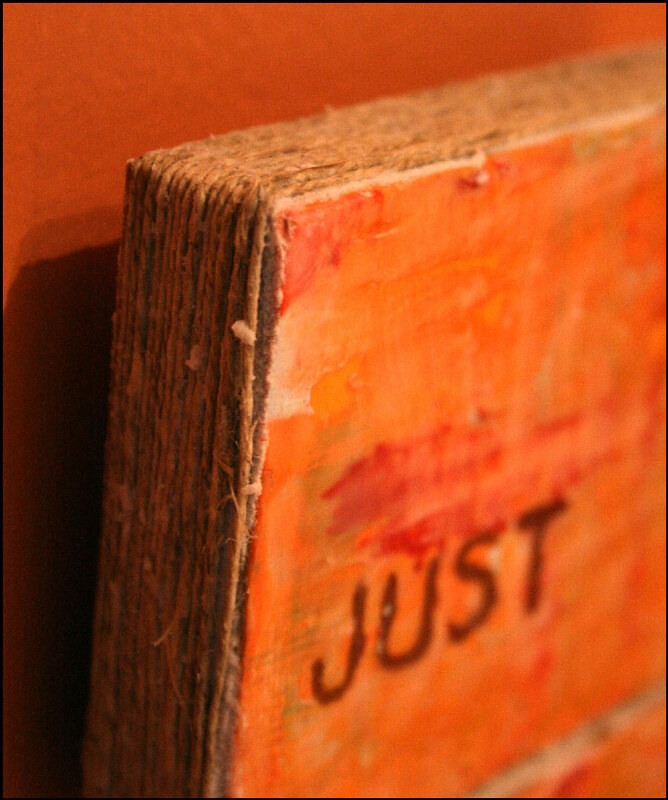 The overall mindful awareness has spilled into non-practice areas of my life. While driving to drop my daughter off at preschool, we passed a man carrying a container for gasoline. He was followed by two small children wearing backpacks who were obviously struggling to keep up with him. There were many reasons not to stop – we were late, I didn’t know how safe it was – who he was, I had stuff galore piled in the van… But in mindful awareness of the situation and WHO I TRULY AM in the midst of the situation, I found myself turning around. We ended up giving him and his children a ride to the gas station and back to his car. Shortly after this, I took Starbucks drinks to my husband and his co-workers. This was in part to share my morning with him, but I found true joy in being able to bring a small bit of indulgence to their morning. And here I am. The snow still falls. I know that using our non-dominant hand, picking up things instead of leaving them on the counter, watching our speech and how we express ourselves, loving our beautiful hands, and mindfully consuming our food can create momentary awareness and deeper insight. What I hadn’t expected (or at least so soon) were the effects outside of the practice. I am becoming more aware of who I am. At my core, I am a deeply compassionate being. I operate out of kindness and love. When I am afraid or rushed, caught up in my ego-based emotions or the stories of another, I forget this. Practicing mundane mindfulness (and incorporating ways to remember this practice) has helped align me with who I am, even outside of those moments of practice. I act out of kindness instead of fear and I notice the snow falling. I am mindfully aware and present. “I” am not here at all. I cannot think of a better reason to practice. I hope you do not mind this temporary diversion from the week’s practice review, but I feel this overview might speak to some who are finding specific practices not of use. Keep going. Keep practicing. This mindful journey IS the way. We’ll explore different paths, but there is nowhere to be but on the path we are on. May you enjoy your dinner and the sun, a rushed breakfast and the clouds, the challenges and the snow.